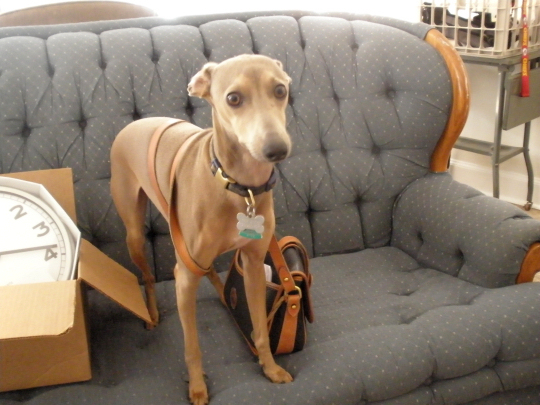 Caught Mosey “wearing” my purse the other day. MOSEY! I LOVE YOU SOOOO MUCH! I GET TO SEE YOU TONIGHT! OMG I’MA STOP YELLING NOW!!! I told him to go buy you a birthday present. OMG!!! Happy Birthday a little late!!!! I’m such a horrible friend!!!!! Facebook doesn’t remind me anymore, so now I have to use an ACTUAL CALENDAR haha. Actually, I just started my facebook again this week but I can’t find you…..gotta snoop around. p.s. Mosey looks so funny and cute!! Love it! My facebook is http://www.facebook.com/staci.elyse ! !